I admit it. I'm a z/OS bigot. If you're looking for an industrial-strength operating system that's secure, reliable, and fast (yes, I said fast) – you just can't get better than z/OS. So conversations with UNIX and Microsoft Windows admins is always entertaining. And each conversation usually follows the same lines: z/OS is too old, too slow, too expensive, too hard. And sure, some of these points can be valid. But the conversations soon end when I talk about one of the top benefits of z/OS: Recording. When you're supporting a critical system, you want to know what is going on. You want to be able to figure out quickly if there's any problem, and where it is. So let's look at something basic: CPU statistics. If you're systems are slow, one of the first things you'll be looking at is the CPU usage of the machine. 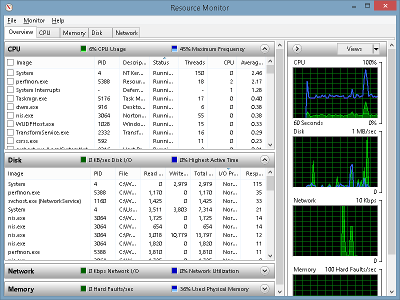 Microsoft Windows has the normal Task Manager and Resource Monitor screens. These quickly show you the CPU usage of the system, and which process is using it. Nice. But what this lacks is detail. For example, what is usage of each individual processor? Are they evenly balanced, or not? One task may be starved of CPU as it can only use one processor, whereas Windows will cheerfully report an average CPU usage that is acceptable. Here's another interesting question – what about the overhead of Windows itself? Is this included in the Windows statistics? UNIX is in a similar boat. There are various tools from the simple top or acct commands to more interesting tools that can be installed. But again, these statistics usually include a simple CPU usage figure. No more. Compare this with z/OS. You get the real CPU usage of the system from type 70 SMF records – for each processor. This is the total CPU usage as measured by the mainframe hardware (actually PR/SM or z/VM – but you get the idea) – not just the opinion of z/OS. But you also get this opinion, broken down by workload category in the type 72 records, and by job/address space in the type 30 records. This means that you can compare type 70 and type 72 (or 30) records to find out the 'uncaptured' CPU – CPU that is being used by the z/OS operating system, but not recorded by z/OS itself. Try doing that in UNIX or Windows. But it gets far more interesting. IBM allows z/OS systems programmers to find out a lot about what is going on with CPU. This information is invaluable when planning for hardware upgrades, improving performance of fixing problems. Consider the SMF 113 record. Today all processors use techniques to squeeze out more performance, including out of order execution, superscalar processing and sophisticated memory caching. An interesting side-effect of these techniques is that some workloads will benefit more from them than others. We talk about this in our article How Fast Is Your Mainframe. But z/OS is the only operating system that will record how efficient your workload is – how much benefit it's getting from these features. This may not sound all that interesting, but is essential when performing mainframe capacity planning. You may need a smaller (or bigger) processor than you think. You may even be able to modify you systems setup to maximise the benefit from these features. But it gets even better. Go to your Windows or UNIX systems, and tell me how your CPU usage has changed over the past 12 months. The chances are that unless you've been recording this information on a spreadsheet, you don't know. z/OS has SMF – a super-efficient central point for collecting usage and performance data. This information is automatically handled by procedures setup for every z/OS system, and usually kept for several years. So it's possible to go back and see what's been happening over time – usually a long time. And not just CPU. Security, I/O, memory, database, CICS transactions and more. The amount of information you can get about your system is staggering – particularly if you're a UNIX or Microsoft Windows administrator. IBM has over the years excelled at this sort of detail. From the many decades of experience with the mainframe, IBM has realised that systems administrators sometimes need detailed knowledge of what's happening 'under the covers' for a mature, essential computing system &dash; and provided it. This is one of the key reasons why z/OS continues to be the most stable and reliable platform on the planet. It's at this point that those conversations with Windows and UNIX admins change to football or the weather.